Monotheism is defined as the belief in the existence of only one god that created the world, is all-powerful and intervenes in the world. A broader definition of monotheism is the belief in one god. A distinction may be made between exclusive monotheism, and both inclusive monotheism and pluriform (panentheistic) monotheism which, while recognising various distinct gods, postulate some underlying unity. According to Jewish, Christian and Islamic tradition, monotheism was the original religion of humanity; this original religion is sometimes referred to as "the Adamic religion", or, in the terms of Andrew Lang, the "Urreligion". Scholars of religion largely abandoned that view in the 19th century in favour of an evolutionary progression from animism via polytheism to monotheism, but by 1974 this theory was less widely held, and a modified view similar to Lang's became more prominent. [need quotation to verify] Austrian anthropologist Wilhelm Schmidt had postulated an Urmonotheismus, "original" or "primitive monotheism" in the 1910s. It was objected[by whom?] 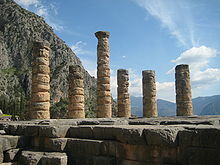 that Judaism, Christianity, and Islam had grown up in opposition to polytheism as had Greek philosophical monotheism. More recently, Karen Armstrong and other authors have returned to the idea of an evolutionary progression beginning with animism, which developed into polytheism, which developed into henotheism, which developed into monolatry, which developed into true monotheism. The tetragrammaton in Paleo-Hebrew (10th century BCE to 135 CE), old Aramaic (10th century BCE to 4th century CE), and square Hebrew (3rd century BCE to present) scripts. Shema Yisrael ("Hear, [O] Israel") are the first two words of a section of the Torah, and is the title of a prayer that serves as a centerpiece of the morning and evening Jewish prayer services. The first verse encapsulates the monotheistic essence of Judaism: "Hear, O Israel: the LORD our God, the LORD is one" (Hebrew: שְׁמַע יִשְׂרָאֵל ה' אֱלֹהֵינוּ ה' אֶחָד), found in Deuteronomy 6:4, sometimes alternatively translated as "The LORD is our God, the LORD alone". Observant Jews consider the Shema to be the most important part of the prayer service in Judaism, and its twice-daily recitation as a mitzvah (religious commandment). It is traditional for Jews to say the Shema as their last words, and for parents to teach their children to say it before they go to sleep at night. 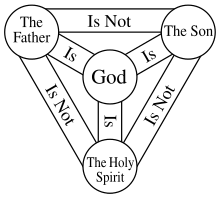 The Trinity is the belief in Christianity that God is one God in essence but three persons: God the Father, God the Son (Jesus), and God the Holy Spirit. 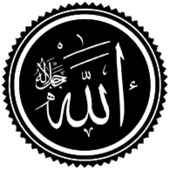 The Qur'an asserts the existence of a single and absolute truth that transcends the world; a unique and indivisible being who is independent of the creation. The Qur'an rejects binary modes of thinking such as the idea of a duality of God by arguing that both good and evil generate from God's creative act. God is a universal god rather than a local, tribal or parochial one; an absolute who integrates all affirmative values and brooks no evil. Ash'ari theology, which dominated Sunni Islam from the tenth to the nineteenth century, insists on ultimate divine transcendence and holds that divine unity is not accessible to human reason. Ash'arism teaches that human knowledge regarding it is limited to what has been revealed through the prophets, and on such paradoxes as God's creation of evil, revelation had to accept bila kayfa (without [asking] how). Medieval Islamic philosopher Ghazali offered a proof of monotheism from omnipotence, asserting there can only be one omnipotent being. For if there were two omnipotent beings, the first would either have power over the second (meaning the second is not omnipotent) or not (meaning the first is not omnipotent); thus implying that there could only be one omnipotent being. Rastafari, sometimes termed Rastafarianism, is classified as both a new religious movement and social movement. It developed in Jamaica during the 1930s. It lacks any centralised authority and there is much heterogeneity among practitioners, who are known as Rastafari, Rastafarians, or Rastas. Rastafari refer to their beliefs, which are based on a specific interpretation of the Bible, as "Rastalogy". Central is a monotheistic belief in a single God—referred to as Jah—who partially resides within each individual. The former emperor of Ethiopia, Haile Selassie, is given central importance. Many Rastas regard him as an incarnation of Jah on Earth and as the Second Coming of Christ. Others regard him as a human prophet who fully recognised the inner divinity within every individual. Shang Dynasty bronze script character for tian (天), which translates to Heaven and sky. Chant, and meditate on the One God, who permeates and pervades the many beings of the whole Universe. God created it, and God spreads through it everywhere. Everywhere I look, I see God. The Perfect Lord is perfectly pervading and permeating the water, the land and the sky; there is no place without Him. Zoroastrianism is a monotheistic religion, although Zoroastrianism is often regarded as dualistic, duotheistic or bitheistic, for its belief in the hypostatis of the ultimately good Ahura Mazda (creative spirit) and the ultimately evil Angra Mainyu (destructive spirit). Zoroastrianism was once one of the largest religions on Earth, as the official religion of the Persian Empire. By some scholars,[who?] the Zoroastrians ("Parsis" or "Zartoshtis") are credited with being some of the first monotheists and having had influence on other world religions. Gathered statistics shows the number of adherents at as many as 3.5 million, with adherents living in many regions, including South Asia. Various New religious movements, such as Rastafari, Cao Đài, Tenrikyo, Seicho no Ie and Cheondoism are monotheistic. Tengrism or Tangrism (sometimes stylized as Tengriism), occasionally referred to as Tengrianism , is a modern term for a Central Asian religion characterized by features of shamanism, animism, totemism, both polytheism and monotheism, and ancestor worship. Historically, it was the prevailing religion of the Bulgars, Turks, Mongols, and Hungarians, as well as the Xiongnu and the Huns. It was the state religion of the six ancient Turkic states: Avar Khaganate, Old Great Bulgaria, First Bulgarian Empire, Göktürks Khaganate, Eastern Tourkia and Western Turkic Khaganate. In Irk Bitig, Tengri is mentioned as Türük Tängrisi (God of Turks). The term is perceived among Turkic peoples as a national religion. ^ Monotheism. Hutchinson Encyclopedia (12th edition). p. 644. ^ a b c Cross, F.L. ; Livingstone, E.A., eds. (1974). "Monotheism". The Oxford Dictionary of the Christian Church (2 ed.). Oxford: Oxford University Press. ^ William Wainwright. "Monotheism". Stanford Encyclopedia of Philosophy. ^ More, Henry (1660). An Explanation of the Grand Mystery of Godliness. London: Flesher & Morden. p. 62. ^ Duchesne-Guillemin, Jacques. "Zoroastrianism". Britannica.com. Encyclopaedia Britannica. Retrieved 16 July 2017. ^ a b c d e f Gnuse, Robert Karl (1 May 1997). "No Other Gods: Emergent Monotheism in Israel". Sheffield Academic Press. p. 225. ISBN 1-85075-657-0. ^ "Ethical monotheism". britannica.com. Encyclopædia Britannica, Inc. Retrieved 25 December 2014. ^ Prager, Dennis. "Ethical Monotheism". jewishvirtuallibrary.org. American-Israeli Cooperative Enterprise. Retrieved 25 December 2014. ^ Fischer, Paul. "Judaism and Ethical Monotheism". platophilosophy. The University of Vermont Blogs. Retrieved 16 July 2017. ^ Armstrong, Karen (1994). A History of God: The 4,000-Year Quest of Judaism, Christianity and Islam. New York City, New York: Ballantine Books. p. 3. ISBN 978-0345384560. ^ Armstrong, Karen (1994). A History of God: The 4,000-Year Quest of Judaism, Christianity and Islam. New York City, New York: Ballantine Books. ISBN 978-0345384560. ^ Compare: Theissen, Gerd (1985). "III: Biblical Monotheism in an Evolutionary Perspective". Biblical Faith: An Evolutionary Approach. Translated by Bowden, John. Minneapolis: Fortress Press (published 2007). p. 64. ISBN 9781451408614. Retrieved 2017-01-13. Evolutionary interpretations of the history of religion are usually understood to be an explanation of the phenomenon of religion as a result of a continuous development. The model for such development is the growth of living beings which leads to increasingly subtle differentiation and integration. Within such a framework of thought, monotheism would be interpreted as the result of a continuous development from animism, polytheism, henotheism and monolatry to belief in the one and only God. Such a development cannot be proved. Monotheism appeared suddenly, though not without being prepared for. ^ Mohammed Amin. "Triangulating the Abrahamic faiths – measuring the closeness of Judaism, Christianity and Islam". Christians were seen as polytheists, due to the doctrine of the Trinity. In the last few hundred years, rabbis have moderated this view slightly, but they still do not regard Christians as being fully monotheistic in the same manner as Jews or Muslims. Muslims were acknowledged as monotheists. ^ Jacobs, Louis (ed.). The Jewish Religion: A Companion 1st Edition. Oxford University Press. pp. 79–80. ISBN 978-0198264637. ^ "Islamic Practices". Universal Life Church Ministries. It is the Islamic belief that Christianity is not monotheistic, as it claims, but rather polytheistic with the trinity-the father, son and the Holy Ghost. ^ https://icucourses.com/pages/025-10-three-persons-are-subsistent-relations ; International Catholic University, The One True God: "The fatherhood constitutes the Person of the Father, the sonship constitutes the Person of the Son, and the passive spiration constitutes the Person of the Holy Spirit. But in God "everything is one where there is no distinction by relative opposition." Consequently, even though in God there are three Persons, there is only one consciousness, one thinking and one loving. The three Persons share equally in the internal divine activity because they are all identified with the divine essence. For, if each divine Person possessed his own distinct and different consciousness, there would be three gods, not the one God of Christian revelation. So you will see that in this regard there is an immense difference between a divine Person and a human person." ^ https://orthodoxwiki.org/Holy_Trinity ; Holy Trinity, Orthodox Wiki: "Orthodox Christians worship the Father, Son, and Holy Spirit—the Holy Trinity, the one God. Following the Holy Scriptures and the Church Fathers, the Church believes that the Trinity is three divine persons (hypostases) who share one essence (ousia). It is paradoxical to believe thus, but that is how God has revealed himself. All three persons are consubstantial with each other, that is, they are of one essence (homoousios) and coeternal. There never was a time when any of the persons of the Trinity did not exist. God is beyond and before time and yet acts within time, moving and speaking within history." ^ https://www.britannica.com/topic/Trinity-Christianity ; Britannica, Trinity: "The Council of Nicaea in 325 stated the crucial formula for that doctrine in its confession that the Son is “of the same substance [homoousios] as the Father,” even though it said very little about the Holy Spirit. Over the next half century, Athanasius defended and refined the Nicene formula, and, by the end of the 4th century, under the leadership of Basil of Caesarea, Gregory of Nyssa, and Gregory of Nazianzus (the Cappadocian Fathers), the doctrine of the Trinity took substantially the form it has maintained ever since. It is accepted in all of the historic confessions of Christianity, even though the impact of the Enlightenment decreased its importance." ^ "BBC - Religion: Judaism". ^ Monotheism, My Jewish Learning, "Many critical scholars think that the interval between the Exodus and the proclamation of monotheism was much longer. Outside of Deuteronomy the earliest passages to state that there are no gods but the Lord are in poems and prayers attributed to Hannah and David, one and a half to two and a half centuries after the Exodus at the earliest. Such statements do not become common until the seventh century B.C.E., the period to which Deuteronomy is dated by the critical view." ^ e. g., Babylonian Talmud, Megilla 7b-17a. ^ a b Boteach, Shmuley (2012) . Kosher Jesus. Springfield, NJ: Gefen Books. pp. 47ff, 111ff, 152ff, . ISBN 9789652295781. ^ a b Albertz, Rainer (1994). A History of Israelite Religion, Volume I: From the Beginnings to the End of the Monarchy. Westminster John Knox. p. 61. ISBN 9780664227197. ^ a b Israel Drazin. "Ancient Jews believed in the existence of many gods". ^ Olson, Roger E. (2002). The Trinity. Wm. B. Eerdmans Publishing. p. 15. ^ "Offenders for a Word". ^ Lawson, Todd (2011). Gnostic Apocalypse and Islam: Qur'an, Exegesis, Messianism and the Literary Origins of the Babi Religion. London: Routledge. ISBN 978-0415495394. ^ Tisdall, William (1911). The Sources of Islam: A Persian Treatise. London: Morrison and Gibb LTF. pp. 46–74. ^ Rudolph, Kurt (2001). Gnosis: The Nature And History of Gnosticism. London: T&T Clark Int'l. pp. 367–390. ISBN 978-0567086402. ^ Hoeller, Stephan A. (2002). Gnosticism: New Light on the Ancient Tradition of Inner Knowing. Wheaton, IL, USA: Quest Books. pp. 155–174. ISBN 978-0835608169. ^ Smith, Andrew (2008). The Gnostics: History, Tradition, Scriptures, Influence. Watkins. ISBN 978-1905857784. ^ Smith, Andrew (2006). The Lost Sayings of Jesus: Teachings from Ancient Christian, Jewish, Gnostic, and Islamic Sources--Annotated & Explained. Skylight Paths Publishing. ISBN 978-1594731723. ^ Van Den Broek, Roelof (1998). Gnosis and Hermeticism from Antiquity to Modern Times. State University of New York Press. pp. 87–108. ISBN 978-0791436110. ^ Tillman, Nagel (2000). The History of Islamic Theology from Muhammad to the Present. Princeton, NJ: Markus Wiener Publishers. pp. 215–234. ISBN 978-1558762039. ^ See: * Accad (2003): According to Ibn Taymiya, although only some Muslims accept the textual veracity of the entire Bible, most Muslims will grant the veracity of most of it. * Esposito (1998, pp. 6,12) * Esposito (2002, pp. 4–5)* Peters (2003, p. 9) * F. Buhl; A. T. Welch. "Muhammad". Encyclopaedia of Islam Online. * Hava Lazarus-Yafeh. "Tahrif". Encyclopaedia of Islam Online. ^ Wainwright, William, "Monotheism", The Stanford Encyclopedia of Philosophy (Fall 2018 Edition), Edward N. Zalta (ed.). ^ e.g. Sahih Bukhari Book #7 Hadith #340, Book #59 Hadith #628, and Book #89 Hadith #299 etc. ^ Khalil ‘ibn Ahmad (d. 786–787), who was in Basra before his death, wrote: "The Sabians believe they belong to the prophet Noah, they read Zaboor (see also Book of Psalms), and their religion looks like Christianity." He also states that "they worship the angels." ^ a b Cole, Juan (1982). The Concept of Manifestation in the Bahá'í Writings. Bahá'í Studies. monograph 9. pp. 1–38. ^ Stockman, Robert. "Jesus Christ in the Baha'i Writings". Baha'i Studies Review. 2 (1). ^ * Lewis, Bernard (1984). The Jews of Islam. Princeton: Princeton University Press. ISBN 0-691-00807-8. ^ Hatcher, William (1985). The Bahá'í Faith. San Francisco: Harper & Row. pp. 115–123. ISBN 0060654414. ^ Smith, P. (1999). A Concise Encyclopedia of the Bahá'í Faith. Oxford, UK: Oneworld Publications. ISBN 1-85168-184-1. ^ Momen, M. (1997). A Short Introduction to the Bahá'í Faith. Oxford, UK: One World Publications. ISBN 1-85168-209-0. 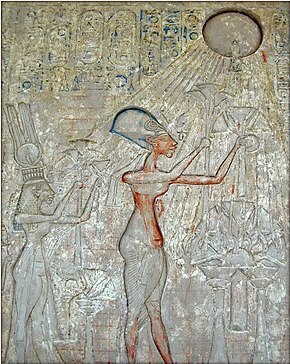 ^ "Ancient Egypt Gods: The Aten". ^ * Crandall, David P. (2000). The Place of Stunted Ironwood Trees: A Year in the Lives of the Cattle-Herding Himba of Namibia. New York: Continuum International Publishing Group Inc. pp. 47. ISBN 0-8264-1270-X. ^ Mallory, J. P.; Adams, D.Q. (2006). The Oxford Introduction to Proto-Indo-European and the Proto-Indo-European World. Oxford, England: Oxford University Press. pp. 408–411 and 423–434. ISBN 978-0-19-929668-2. ^ Katičić, Radoslav (2008). Božanski boj: Tragovima svetih pjesama naše pretkršćanske starine (PDF). Zagreb: IBIS GRAFIKA. ISBN 978-953-6927-41-8. Archived from the original (PDF) on 2015-10-18. ^ "Concept Of God In Hinduism By Dr Naik". Islam101.com. Retrieved 2012-06-05. ^ Delmonico, N. (2004). "The History Of Indic Monotheism And Modern Chaitanya Vaishnavism". The Hare Krishna Movement: the Postcharismatic Fate of a Religious Transplant. ISBN 978-0-231-12256-6. Retrieved 2008-04-12. ^ Matchett, Freda (2000). Krsna, Lord or Avatara? the relationship between Krsna and Visnu: in the context of the Avatara myth as presented by the Harivamsa, the Visnupurana and the Bhagavatapurana. Surrey: Routledge. p. 4. ISBN 0-7007-1281-X. ^ "Rig Veda: A Metrically Restored Text with an Introduction and Notes, HOS, 1994". Vedavid.org. Retrieved 2012-06-05. ^ Tapasyananda (1991). 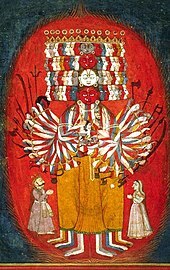 Bhakti Schools of Vedānta. Madras: Sri Ramakrishna Math. ISBN 81-7120-226-8. ^ For an overview of the Śatarudriya see: Kramrisch, pp. 71-74. ^ For the Śatarudrīya as an early example of enumeration of divine names, see: Flood (1996), p. 152. ^ Studies, Institute for Metaphysical; Inc, The Institute for Metaphysi Studies; MM, MR Charles D. Levy; Levy, Charles D. (2010-08-30). The Arian Christian Doctrines: The Origins of Christianity. Metaphysical Institute. p. 161. ISBN 9781453764619. ^ Ardinger, Barbara (2006). Pagan Every Day: Finding the Extraordinary in Our Ordinary Lives. Weisfer. p. 13. ISBN 978-1-57863-332-6. ^ Nesbitt, Eleanor M. (15 November 2005). Sikhi: a very short introduction. Oxford University Press. p. 136. ISBN 978-0-19-280601-7. Retrieved 19 July 2010. ^ Parrinder, Geoffrey (1971). World Religions:From Ancient History to the Present. USA: Hamlyn Publishing Group. p. 252. ISBN 978-0-87196-129-7. ^ "Sikh Beliefs and Doctrine". ReligionFacts. Retrieved 2012-06-05. ^ "A Short Introduction to Sikhism". Multifaithcentre.org. Archived from the original on 2009-12-21. Retrieved 2012-06-05. ^ "Buddhism in China: A Historical Sketch", The Journal of Religion. ^ Catholic Encyclopedia - Eschatology "The radical defect of the Persian religion was its dualistic conception of deity." ^ "Major Religions Ranked by Size". Adherents.com. Retrieved 2012-06-05. ^ McKirahan, Richard D. "Xenophanes of Colophon. Philosophy Before Socrates. Indianapolis: Hackett Publishing Company, 1994. 61. Print. ^ Osborne, Catherine. "Chapter 4." Presocratic Philosophy: A Very Short Introduction. Oxford UP. 62. Print. ^ Lamb, W. R. M. "Euthyphro". Perseus. Tufts University. Retrieved 25 March 2017. ^ Wyller, Egil A. (1997). Henologische Perspektiven II: zu Ehren Egil A. Wyller, Internales Henologie-Symposium. Amsterdam, Netherlands: Rodopi. pp. 5–6. ISBN 90-420-0357-X. Retrieved 25 March 2017. ^ Schürmann, Reiner; Lily, Reginald (2003). Broken Hegemonies. Bloomington, Indiana: Indiana University Press. pp. 143–144. ISBN 0-253-34144-2. Retrieved 25 March 2017. ^ Dictionary of Deities and Demons in the Bible, s.v. "Apollo". ^ The spelling Tengrism is found in the 1960s, e.g. Bergounioux (ed. ), Primitive and prehistoric religions, Volume 140, Hawthorn Books, 1966, p. 80. Tengrianism is a reflection of the Russian term, Тенгрианство. It is reported in 1996 ("so-called Tengrianism") in Shnirelʹman (ed. ), Who gets the past? : competition for ancestors among non-Russian intellectuals in Russia, Woodrow Wilson Center Press, 1996, ISBN 978-0-8018-5221-3, p. 31 in the context of the nationalist rivalry over Bulgar legacy. The spellings Tengriism and Tengrianity are later, reported (deprecatingly, in scare quotes) in 2004 in Central Asiatic journal, vol. 48-49 (2004), p. 238. The Turkish term Tengricilik is also found from the 1990s. Mongolian Тэнгэр шүтлэг is used in a 1999 biography of Genghis Khan (Boldbaatar et. al, Чингис хаан, 1162-1227, Хаадын сан, 1999, p. 18). ^ "There is no doubt that between the 6th and 9th centuries Tengrism was the religion among the nomads of the steppes" Yazar András Róna-Tas, Hungarians and Europe in the early Middle Ages: an introduction to early Hungarian history, Yayıncı Central European University Press, 1999, ISBN 978-963-9116-48-1, p. 151. ^ Hungarians & Europe in the Early Middle Ages: An Introduction to Early ... - András Róna-Tas - Google Kitaplar. Books.google.com. Retrieved 2013-02-19. ^ Ostler, Jeffry. The Plains Sioux and U.S. Colonialism from Lewis and Clark to Wounded Knee. Cambridge University Press, Jul 5, 2004. ISBN 0521605903, pg 26. ^ Thomas, Robert Murray. Manitou and God: North-American Indian Religions and Christian Culture. Greenwood Publishing Group, 2007. ISBN 0313347794 pg 35. ^ Means, Robert. Where White Men Fear to Tread: The Autobiography of Russell Means. Macmillan, 1995. ISBN 0312147619 pg 241.